Rainy rain rain. Oh how it's fun to live in Wales. At least there doesn't seem to be a queue at The Globe this evening, the place where I've lost count the amount of times I've been stood outside when the support act has already started due to the sloths working the door. It's my first time visiting since seeing Public Service Broadcasting a few months ago, and one thing's for certain, there seems to be a much tighter security procedure in place. 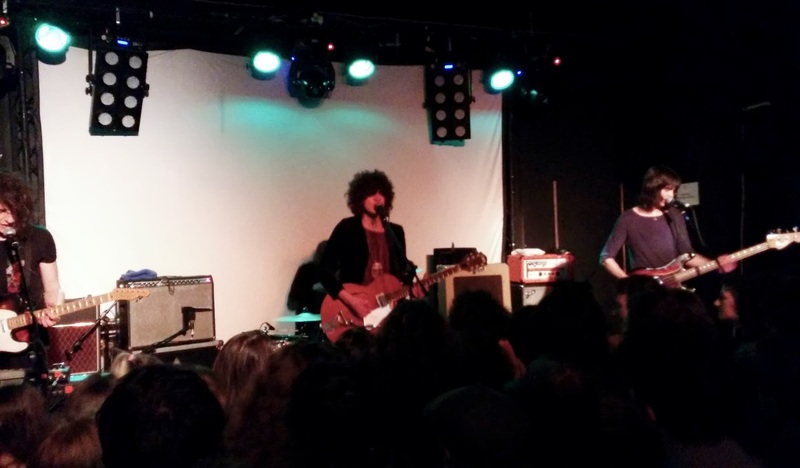 A full body search (well, patted down, thankfully no rubber glove) for a Temples gig? Seems a bit much surely? Thankfully I made it through relatively unscathed with plenty of time to catch Dark Bells take to the stage. Their latest single 'In Head' already has the Blog scene whipped in to a frenzy and it's with no surprise really through their commandeering sound. The pair (joined by Geno Carrapetta their live drummer tonight) waste no time in rattling out big unhinged guitars and basslines that cascade around the venue. 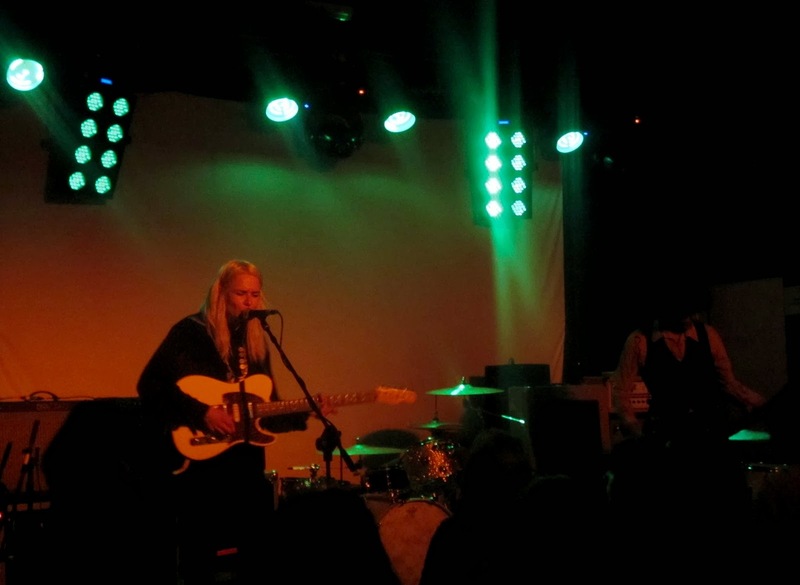 For a sold out show it seems as though everyone's decided to turn up late but that doesn't seem to unhinge the London based Australian duo as they deliver a fine performance, Teneil Throssell's vocals swirling in a fuzzy haze of washed out reverb. As psychedelic melodies build in to crashing waves of euphoric ecstasy quiet mid sections lull in to a false sense of security before taking you down whilst most vulnerable. Layered beautifully Dark Bells sure know a thing or two about bundling up frantic and chaotic rhythm sections delivering them in a wonderful streamline like way. I'm sure you'll be hearing a lot more of them in the not too distant future! Next up was a band I've already had the pleasure of seeing towards the tail end of last year at Cardiff's Swn Festival. Having sadly missed the end of their show rushing to see someone else I was most looking forward to catching their full performance tonight. Transporting us to a warmer time and place Childhood bring their sunshine vibes and tropically infused melodies in big style tonight. With crisp vocal lines and jangly guitars that clang throughout the now almost at full capacity venue the crowd watch on attentively as lead singer Ben Romans-Hopcraft eats up the microphone. I was wondering how they'd fit in on the bill with Temples as predominantly their music's more Indie than Psychedelic but with long drawn out instrumental mid sections they more than live up to expectations. "This is a new song" announces Ben with the (as far as I'm aware) untitled track delving in to their more experimental side with immediate riffs that switch tempo throughout. Childhood's music is both reassuringly nostalgic and hair-raisingly fresh and with contradictions aside always ascending. Hurry up with a debut album is all I can say. 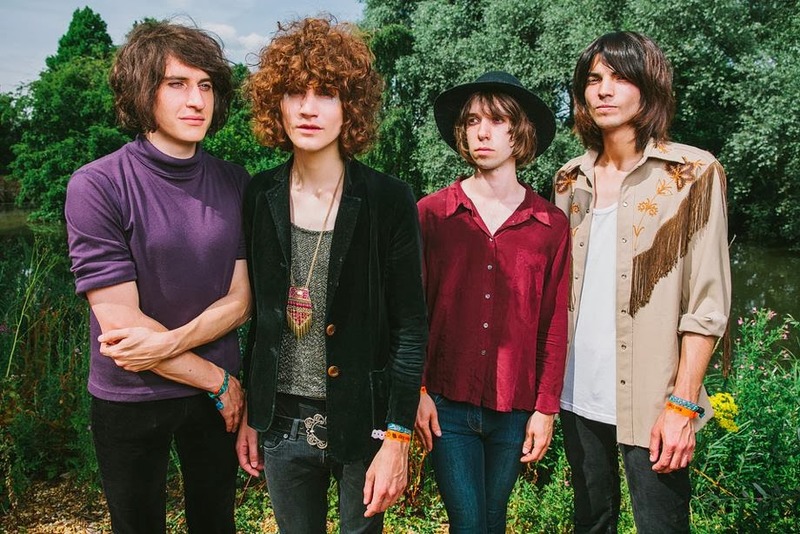 With a slightly longer wait between acts as the stage crew frantically prepare for the arrival of Temples James Bagshaw and co finally emerge to much applause. It's strange to think no little than over a year ago I hadn't heard of the Kettering band yet with a debut album causing quite the stir and selling out multiple dates on their UK tour it's safe to say they've most definitely impressed. Now I'm not sure if there was some kind of memo I missed about having to have long hair to fit in but I significantly had the shortest out of anyone last night, male crowd and band alike. Hopefully no one noticed? Leading us in with early single Colours To Life the band remain pretty understated throughout. Then again, who needs the mass stage banter when the music does more than enough talking to make up for it. Settled within the current rush of Psych-Rock that's enforcing a strong hold on our UK scene through the likes of Toy and The Horrors to Pond and S.C.U.M Temples manage to carve out their own niche in magnificent detail. With swaggering translucent basslines and guitars doused in 60s sentiment the band play much of their debut 'Sun Structures', transcendental and soaked in culture. It's around the midway point that The Globe's new security enforcement rears its ugly head once more as pockets of the crowd begin to jump around enthusiastically. Apparently this isn't allowed here. Who'd have thought it. A gig where you can't have fun. Next we'll be told to sit with our legs crossed and fingers on lips. If this is the way The Globe handle things then I'm sorry but it's just totally not on. Thankfully that's not going to spoil any ones night though as the energy remains throughout. 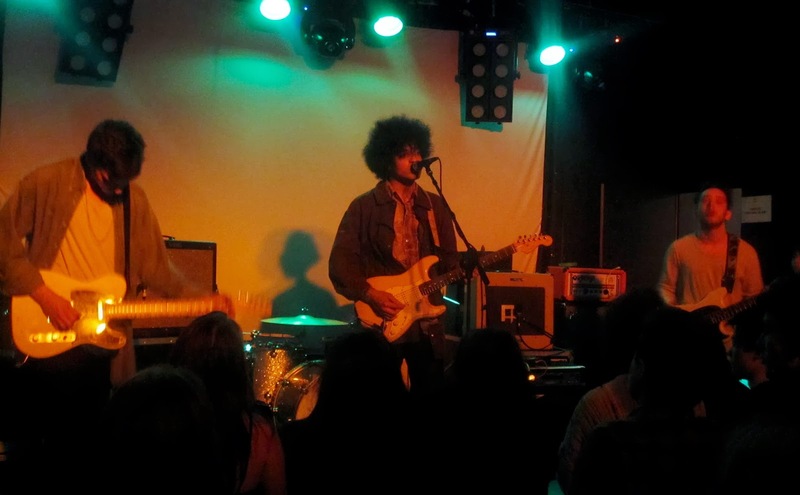 Powering through an hours worth of material the Northamptonshire four-piece show off more than their worth as they let loose on their Glam-Rock side blasting the swaying nuances of Keep In the Dark before ending on the crowd pleasing Shelter Song. The chants of "we want more" throughout the lofty residence do just enough to entice the band back out on stage for a 1 track encore as they bring their kaleidoscopic sound of modern psychedelia to a close. A fitting end to a showstopping performance answering just why Temples are the sound of now encapsulating a whole era making it accessible to the masses once more.